Every so often, your wood floors will need to undergo the process of deep cleaning to ensure they stay beautiful for years to come! 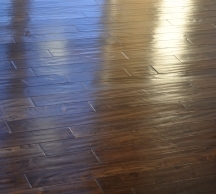 Everybody loves the beauty and shine of a new hardwood floor, but over time the shine fades. Most people assume that this is because the polyurethane wears off but it is actually usually the result of dirt and grime that normal washing doesn’t get. Deep cleaning your wood floors is the answer. It’s time to deep clean your wood floors when you find that your normal cleaning methods just aren’t cutting it. After you’ve washed the floor like you normally do, you should be able to walk around on it in white socks and have the socks not get dirty. If the socks get dirty after an hour or two of walking on the “clean” floor, it is time for a deep clean. Wood floors are usually covered with a polyurethane coating that is impervious to water (as long as it cured correctly). However, over time, a coating of dirt, oil, and grime can build up on the polyurethane layer. This rime grips the polyurethane and is very hard to clean off. Deep cleaning achieves this, by loosening the bond between that grime layer and the polyurethane layer and washing the contaminants away. In addition to the right cleaner, you also need a really sturdy microfiber mop and several microfiber pads. Depending on how grimy the floor is, you may have to go over the same area multiple times. A sturdy mop will allow you to really put the force that you need to into the scrubbing. Your Swiffer will not cut it. Keep a white cloth on hand to check sections for cleanliness as you go, and when you’re all done, buff the floor with a dry pad till it really shines. When you’re making cuts, you need them to stay straight. No matter what material you’re cutting through, Festool’s guide systems and saw accessories will help you make straight, clean cuts every single time. This entry was posted on Friday, March 22nd, 2019 at 10:55 am. Both comments and pings are currently closed.